Thousands of books have been written about how to scale a business, product market fit, building teams, dealing with clients, hiring people, managing people yet most fail to tell you a hidden secret that would change the way you do everything you do in your business. As with anything this hidden secret, is not so secret, its something that has been said through the ages by some of the most respected people of our time from Peter Drucker to Dali Llama. Complicated but necessary, interoperability is one of the biggest issues facing the industry today. If we want to get technical, however, interoperability is defined as “the ability of computer systems or software to exchange and make use of information.” There are two important parts here — 1) to exchange, and 2) to make use of. Let’s look at the exchange part first. The issue of data exchanges is so paramount in certain industries, including healthcare, that there are actually boards and foundations created and dedicated fully to matters surrounding it, including the upholding of standards. But what’s fascinating about healthcare is that in this industry a consensus has yet to be reached regarding what those standards should be — and the standards that do exist can be left for interpretation of what can be implemented. Let me put it in a way we can all relate to. Let’s say you get sick (hopefully that doesn’t happen to you) and have to go to the doctor. You fill out a lot of paperwork, then spend time in a room with the doctor and probably a computer, where he or she documents everything. And you don’t get a copy of any of the information, it just goes somewhere. Next, maybe you need to see a specialist as a follow-up to this visit. This second doctor asks you to fill out all the same information and report everything that happened at your last doctor’s appointment. So either you have to try to remember all the details, or perhaps they call your first doctor to get the information, which can take time. Can you imagine if this were how ATMs worked? It would look something like this: You go to your bank and make a deposit. Then you go to an ATM to get money and it asks you to sign up for a bank account. Then a representative has to call your other bank to get verification before you can get your hands on your money — and you can consider yourself lucky if they can do it on the spot. Can you imagine doing this for every single ATM transaction? Parents with chronically sick children have figured out the workaround to this. Maybe you’ve seen or even been one of those parents who resolves to carrying around a binder containing their child’s medical information. They’re trying to keep all the records organized and at the ready, so they can share them with doctors at a moment’s notice. How did it come to this? To answer that question, we must first look back. In the beginning, there were manila folders. (Ah, the age before computers …) In some ways, that system was simpler than what we have today, but in other ways, it’s far more complicated, insecure, unsearchable and unusable. Prior to 1900, there were actually no medical standards for keeping records about patients. And with the rise of hospitals and medical education in the second half of the 19th century, we began seeing official medical records as hospitals started keeping ledgers. By 1960 or so, computers were playing a role in the medical field, standardizing the storing and sharing of medical records. What really changed things was U.S. Congress’ new Health Insurance Portability and Accountability Act (HIPAA) (1996), which required standards for electronic medical records (well, sort of). And of course, no one can forget Obamacare, which launched in 2010 and introduced new reporting requirements. Great, so we have standards now, right? Well, not exactly. You see, those laws aren’t about standards, they’re about reporting. So we transitioned from manila folders to software. But all the software did was make the folders and information inside them electronic. I don’t want to downplay the value of these systems, however, the simple fact is that today that software is all about recording, reporting and billing. The next challenge will be to ensure the information is input in a way that is totally standardized and reliable. Software innovation: When you make a product you ultimately need to create a competitive edge; the way that was done 50 years ago is different than the way we would like to see it done today. It used to be OK to create things that ultimately created “black boxes” of sorts. Now I won’t say that was the intention of the software makers, just the time in history — after all, you were often the only player or one of a few players. However, today we are all about a sharing economy and working with each other — think Airbnb, Uber and Postmates. Standards: There has been no adoption of any single standard — and most standards have variations in them and are left for interpretation of the user to do it as they see fit — the farthest and most standard two that are used and have consistency are HL7 and CCDA — unfortunately it requires more work than a simple login to get your records and each vendor has to integrate each interface (the way data is sent) separately. No driving force: Unfortunately, the only driving force behind standardization today is the need to report information to the government which is used for cost efficiency and payments as well as in today’s world Population Health. Consumers: We, as consumers, have yet to push the industry, mostly because we’re barely involved in our own health. This needs to change and is arguably the largest area of improvement we need to make. Regulation: The regulations that have been put in place for information standardization include a “pass/fail” check when a software vendor is making the product — but no one follows up on the product during implementation. This often results in cases in which software is implemented at a hospital and it can pass the standards check, yet the functionality of it is not effective outside the four walls — for instance ask your doctor next time to send a “direct message” to another email, most have no idea how to do it or if their software can do it. Another area we need to focus on is ownership — more on this later in the article. Time: Standards such as HL7 often require that a team work together to map that data. So imagine having five people multiplied by 100 applications to connect — you would need 500 people to pull this off. And since that isn’t realistic, these projects take time and run in a waterfall effect (meaning one after the other). Direct: A protocol that allows the exchange of “secure” information. Think of it like encrypted email with a file in it that’s in a standard format (although, again, “standard” here is left for interpretation). The idea is that the direct message sends a CCDA. CCDA: A file format that has to have a particular structure, and usually does, however each interface can have some things that are non standard or inconsistent depending on what each vendor sends in the CCDA. HIE: A health information exchange into which data is added and then transformed so that it’s uniform; an HIA is used to share data across a particular population or given region. FHIR: A protocol that wraps an existing standard (right now that’s HL7 ) into a more modern standard REST API so that developers can build applications that help you access and use your data. FHIR has the potential to solve at least the data sharing and access for patients — however there is a question of ownership (see Ownership later in article) AND the fact that a machine technically can’t access your records according to laws. Interfaces: There are standard interfaces like ADT, CCDA and HL7 that can share data, however, each feed again is unique, is time-consuming to connect and is left for interpretation. Now all this being said, I want to make sure everyone understands we’re actually sharing data, quite a bit actually. In fact, Epic — one of the world’s largest EMR software providers — is often blamed with not being able to share data or work well with others and yet Epic shares a lot of data and even displays it on their website loud and clear for everyone to see. There are also many efforts to put together a common HIE and other data repositories . Some companies’ visions for this are about a shared society of information and others are about a common HIE being the single source of truth. Times change but we haven’t changed the way things work — this is why I argue it’s not about disruption, it’s about transformation. Just like we invest in personal growth, so must industries invest in the growth of their companies. What got us here in healthcare will not get us to the next step in healthcare and to get there we must create a more unified way of sharing information that is fast, secure and reliable. Vendors/Developers: First, vendors of products in healthcare must start working with new standards and adopting new technologies to integrate and work with data rather than conforming to the old ways of working. Government: The government must set guidelines to help companies ensure they reach this goal, for instance, with Meaningful Use 2 we saw the requirement for APIs, which is a more modern way to connect data. Health Systems: Rather than focusing on making sure just reporting gets done, it’s our job in healthcare to work to start pushing innovation and building systems that are built to scale for the new healthcare era. Consumers: We play a big role here — we need to ask questions, ask for our data and be more involved in our health. They can’t ignore us, as we are ultimately the end user. Agreement: What I mean by this is that we don’t all agree on words, for instance if you ask someone what population health means or interoperability means you will get different answers. If you were to ask a bank what it means to transfer funds every single one would have the same answer. All right, so say we figure all of this out — we can just launch it, right? Well, kind of. Unfortunately, most companies have a long product life cycle, which means that we could see it take 1 year just to get developed and another 2 to 3 years before all their clients are on the particular version that allows for this. This then puts pressure on vendors to reduce their product life cycle and provide more frequent updates. Compare that to Facebook, Google or Uber and that number shrinks to every 2 weeks on average. I won’t get into all the specifics here — there’s only one thing I want to highlight: If/when and how Obamacare gets replaced, there are a few things we can count on that are positive impacts on our society, which is that almost all the bills I’ve read have a few positive similarities. High deductible plans: We’ll continue to see the use of this and this means we have to be more careful of what we do and how we spend. Now why are these two relevant? For starters, if we start removing state borders then we also must allow data sharing to work much better, faster and more instant, or at least allow the patient to be the center of care. The second part about high deductible plans is also vital as it means we need to — as consumers — get more involved in our health, which will drive care and lower costs for both us and the system. But who really owns your record? Maybe you have thought about this or maybe you have not. However, another challenge here is ownership of your medical record — have you ever really stopped to ask yourself who owns your patient data? 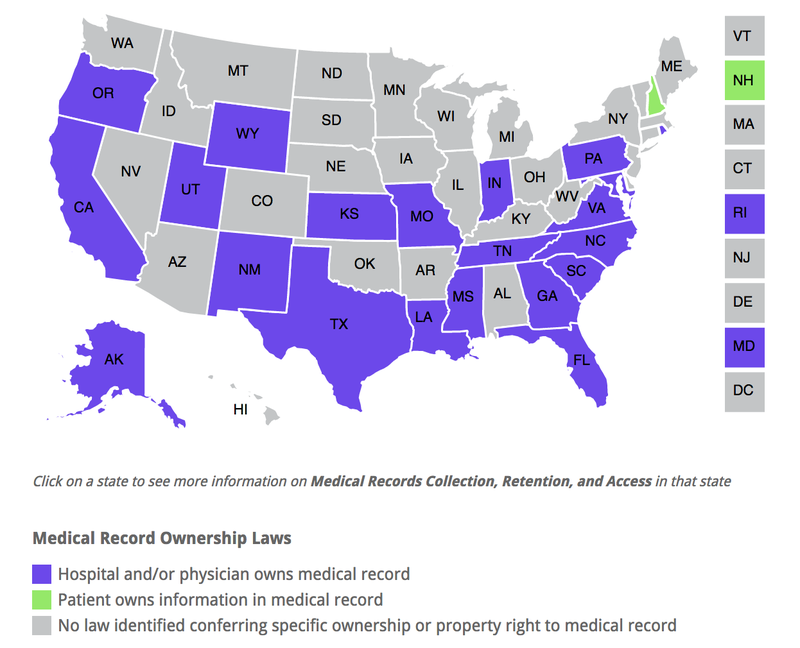 According to the graphic above, you can see by state who actually owns patient records. As it stands today, technically, the only state where you own your record is New Hampshire! If we’re going to make interoperability work, we also must put the patient in the center and allow the patient to be the center of sharing and caring for that information. This has been an ongoing challenge that many have tried to solve — including Google and Microsoft. Unfortunately, it’s also not an easy problem to solve and one of the bigger drivers is that we as consumers aren’t asking for this — yet. You might be wondering how this is relevant to interoperability. To put it very simply, if you don’t have control of over your record, how can you help make the change? Demand creates change, and in order to create demand we must have some sort of ownership over what it is we are demanding. Healthcare may still be struggling when it comes to resolving interoperability; however, the industry is at least having way more discussions about the topic. Taking into consideration population health, the push to develop a greater patient experience, health systems and the industry as a whole, it’s clear we’ll have to start looking at more ways to solve this issue. The biggest advice I can leave you with is to play an active role in your own health by keeping a copy of your own health records. And ask questions; ask for more information from your provider. There is a lot of change coming with the advent of perhaps replacing Obamacare and also what the industry decides to do as a whole to meet population health demands. I believe interoperability is here — just not perhaps in the way that we are expecting it. We can in fact share records, we can transfer records, we canalso push and pull records — what we can’t do is keep them in sync, we can’t build anything on top of it, the data is sometimes good quality and sometimes not so good quality, sometimes the data is free form and sometimes its not. So perhaps we are asking the wrong questions to solve the right answer. I call it data liquidity — in order to have data flow freely we must have data liquidity. The driving force of data liquidity becomes demand, today the reality is most demand isn’t coming in yet, or perhaps not enough to make this a big focus, but it is coming, and when it comes then it will be solved. The question that remains is: Will we make the challenge of interoperability more complex, or will we simplify it and are we asking the right question? It offers convenience, access and resources. But the widespread adoption of telehealth remains complicated. RPM is one form of telehealth by which devices are sent to a patient’s home to monitor chronic conditions. This is especially useful in a post-hospital situation to maintain quality of care and reduce the chances of the patient ending up back in the hospital. At its core, that’s what telehealth really is — and should be — about: Providing convenience, delivering excellent quality of care, minimize a patient’s need for unplanned hospital visits and just generally making it easier to improve a person’s overall health. So if telehealth is so great, why isn’t it everywhere already? I can answer that question and others for you. But before we dive into the conversations currently surrounding telehealth, let’s add some context. When “tele-” is used to describe something, it means there are electronic means involved so that two or more parties can accomplish something without having to be in the same room. When you see “tele-” used with “health” or “care,” it means care provided over electronic means so that the two people — usually a clinician and/or patient, or in some cases, multiple clinicians — can interact without meeting face to face. The idea is that telehealth can allow providers, hospitals and health technology companies like Hart to extend tools and resources to patients; and it can allow patients to receive more instantaneous answers to their health questions. I’ll give you some examples to help clarify. Let’s look at a few forms of telecare that exist today. Telehealth is used to broadly describe health information services, education and care services delivered electronically. It’s a term that umbrellas everything that happens under it. Telemedicine is often confused with telehealth, or the two are wrongly used interchangeably. But telemedicine is more defined in that it specifically refers to using telecommunications technology to provide remote clinical services to patients. Examples include digitally transmitting medical images, doing remote diagnostics (like RPM) and/or video consults (think FaceTime). These interactions may be with your primary care physician; in other cases, they may be with a remote team that will ultimately keep your doctor in loop. Teletherapy is the practice of therapy done via telemedicine, for example, personal therapy, family therapy or even addiction therapy. Telecare involves a team of doctors, nurses and others taking care of patients remotely. This allows a patient to maintain his or her independence and quality of care while staying at home. Just a heads up that I’ll be using “telehealth” throughout the rest of this post to keep things simple. But it’s good for you to have some knowledge of the subtle differences between the related terms. The term telehealth describes health information services, education and care services delivered electronically. Because this technology has such a broad application across so many areas in healthcare, it can offer greater convenience and faster care to everyone. Here are some specific examples. Arguably the most exciting area is our ability to extend care to people we were not able to reach before. Imagine having doctors providing care to patients in other countries, remote areas or even disaster areas. This significantly improves the care someone receives and can actually help eliminate the need to travel long distances just to receive care. As I mentioned, Hart began in the RPM area. A great service that allows a care team to remotely take care of a patient after he or she has been discharged from a hospital, RPM enables the patient to enjoy the comforts of home, safely. Plus research has shown patients may heal better and faster when they are surrounded by familiar settings and, in particular, their loved ones. Another major way this technology is being used is to provide consultation between specialists and caregivers. For example, maybe your doctor wants a specialist’s opinion on one of your medical images in order to make an intelligent diagnosis. Instead of referring you to the specialist and making you do a lot of back and forth with additional appointments and paperwork, your doctor could use telehealth to get instant feedback, saving everyone time and money. I’ve already written about companies establishing on-site clinics for their employees. Sometimes those clinics are criticized by people who point out that remote employees or out-of-town family members are left out. But telehealth allows those individuals to visit with the very same doctors and care team as the on-site employees do. Interacting with familiar faces can be important to retention since many patients perceive these individuals to be more fully involved in their care. I’m sure you can see and think of many other areas in which we can use these types of services. We’re seeing their numbers grow rapidly and I enjoy learning about new telehealth services that are springing up all the time. All of this sounds great but in my opinion there are benefits to telehealth beyond just the ability for tele-visits. Nothing is more important than getting the right answer quickly from your doctor, however, there are other things to consider here that offer amazing value to us as patients, and of course, there’s also value for the physician. No one can argue how convenient telehealth services are. Compare the traditional method of trying to make a doctor appointment to just picking up your smartphone. In the latter scenario, you can access your doctor’s office so much faster. Or if you use voice commands to your Echo or your Google Home device, then your access is even faster still. It might take 5 to 20 minutes to get a member of your care team up on your screen. Teladoc, a leading provider of telehealth (that just surpassed 2 million visits), advertises an average wait time of 22 minutes. All things considered, that’s not bad. That’s how long it takes most of us just to schedule an appointment with our primary doctor over the phone. That’s 20-some minutes not to be seen but just to be scheduled. If you have a telehealth app on your smartphone, you now have a way for a care team to communicate with you. That’s a great opportunity for engagement, whether it’s before or after your visit — maybe even right after your appointment while you’re waiting for a call back. And in the event you’re an RPM patient, you actually have a device that’s collecting information 24/7 from the medical devices you’re using. All of these are touch points that are ripe for engagement and can allow your care team to better facilitate your overall health. The best part about telehealth services is that they’re not just for those who are sick. There are many times when we need to go see the doctor for simple things that could be accomplished via telehealth technology. And with more and more providers doing this, now we can. At this point you might be thinking, Wow, this could save all of us a lot of time and money and also make those quick cold flus go away much faster. Why isn’t this widely used already? I’ll fill you in on the answer. It’s time to explore the other side of telehealth, the one where telehealth meets the law. Telehealth services can boost prevention and patient engagement plus offer convenience for both patients and doctors. The general premise of laws is that they’re there to protect us as a society and uphold certain values. But in some cases, such as telehealth, the law can’t keep up with the industry’s changes and ultimately hinder growth and innovation. The freedom to post anything on the internet and reach anyone instantaneously is great. Medicine, however, is something special and, let’s be honest, requires guardrails. When it comes to taking care of you, it’s important that the doctors who are giving you an opinion are board-certified. After all, you don’t want just any random person trying to give you advice about a condition you might have — or end up using Mr. Google, which sometimes ( often) leads to information with a disclaimer that says a condition can result in X, Y, Z “… or death.” Not very comforting. Each state has its own laws for telehealth too. This means a doctor can’t practice across state lines unless he or she is licensed in that state. You can see how this can get tricky where telehealth is concerned. Similar to when doctors see patients in person, they must be licensed in every state in which they deliver telehealth services. Of course, patients usually like the sound of telehealth but wonder whether it will cost them more or less than what they’re already paying for healthcare. The reality is, it actually costs less than what most people would think, especially when you consider costs associated with your time, gasoline, and the wear and tear on your car. User Pays: You cover the cost of the visit. Insurance Pays: Your insurance covers the cost of the visit. Sponsor Pays: Your employer or other entity sponsors/pays the coverage fee. Among the leading telehealth providers, the price for visits ranges between $49 and $99. All things considered, that’s a fairly economical price range so long as you aren’t calling the doctor every day. Or what if it were the middle of the night and your child were crying and you had no idea what was going on? That price would most certainly be worth the immediate answers and peace of mind. Most of these companies have online signup or even mobile apps — just register and you’re ready to go. Some companies have a subscription model which requires you to pay a yearly fee in exchange for a lower price per visit or several free visits over a certain period of time. A lot of insurance companies are still catching up to this, however, great strides have been made. If you use your insurance, the cost will vary depending on your plan type and your co-pay. In order for a telehealth company to take insurance, it has to make a contract with each insurance plan provider, which can take some time to get in place. That’s one reason why a company may not presently take insurance or insurance by a specific plan provider. Most likely you’ll see that by the end of 2017 all insurance plans will have some form of coverage for telehealth. It’s in their best interest, after all, as it lowers their own overall costs when insured customers make use of telehealth. Additionally, an employer or another sponsor can choose to pay for the entire cost or subsidize the cost of a visit. There are other companies that allow you to call a doctor to make a house call on demand. While that’s not telehealth, it’s still using digital technology to summon a doctor to your doorstep — kind of like back when your parents were children and the doctor used to visit their homes. The prices for these vary and there are also options for both payment models. Although the cost of telehealth visits can vary, for many people the convenience and peace of mind is well worth it. By now you’re probably excited about this type of technology. And if you’re like me, you’re probably wondering why your own doctor might not do this yet. Remember the state laws and insurance complications I mentioned? While some aspects of telehealth have evolved rather quickly in response to consumer demands, the area of contracts with doctors is still a work in progress. Simply put, not all doctors can get paid for this type of service … yet. This is changing more and more as insurance companies are seeing the benefit. Today doctors still requires you to come in so they can bill the insurance company , that’s how they make money. Unfortunately, they can’t yet bill for telehealth visits in all areas or all states. It’s not just telehealth that’s evolving — the healthcare industry as a whole is undergoing many changes. That includes changes in how we pay for value, and there are new laws being put in place to focus more on the value than the fees. Hence, it’s becoming more prevalent to see your health system and/or doctor offering telehealth services. There are also other complications to consider, such as balancing the doctor’s schedule — after all, some people still need to go see the doctor in person, as not everything can be addressed via video. How do I trust the service? The short answer is: Yes, it is safe; yes, it is secure. However, all that said, you should do your research and go with a reputable company. By law, the encounter you have with the doctor is only between you and the doctor — same as when you visit with your doctor in person. Once the video connection is made, that video connection is secure, private and never preserved as part of your medical record. Regardless, do your homework. Check the privacy terms just as you would for any service you use. And keep in mind that laws can change, so review those terms often. Maybe in time all of these and others will be possible over tele-means, without the patient ever leaving home. I would argue, however, that there will always be a reason to see the doctor in person. My biggest reason for it? Simply put, we like the interaction of being with others — we are, after all, social beings. You’ll see telehealth practices evolve over time and you may be hearing the term “population health” more and more as healthcare focuses on While this has many different meanings, I have my own predictions about where we will see health go. Health Coaching: I believe you’ll be assigned some sort of a health coach or care navigator — someone who’ll be your guide on your health journey. Imagine them seeing your step tracking, working with you on your diet and becoming your personal health cheerleader. Precision Medicine: With DNA sequencing becoming cheaper every day, the thought of precision medicine becomes more and more appealing. This will be the practice of medicine that is tailored to one person and only one person: you. Imagine knowing exactly what you need to do to keep your body in its top shape. This is an exciting time in medicine and there’s no telling what the future will hold. Whatever that turns out to be, I’m looking forward to all the healthcare transformations which will certainly make our lives a whole lot easier, healthier and longer. Posted byMohamed Alkady July 17, 2017 Posted inTelehealthLeave a comment on Telehealth is great. So why isn’t it everywhere already? Employers and employees alike are seeing the benefits of taking care of a company’s most valued asset by putting a doctor on-site. Employers are beginning to care more and more about your health. This is because illness (from sick days to workers compensation) costs the U.S. workforce $576 billion annually. And yet, employees skipping a doctor visit to complete a client presentation or forgoing a chiropractic adjustment to get the kids to school on time is typical in Orange County, according to Annette Walker, president, strategy for Providence St. Joseph Health, and chief executive of St. Joseph Health. We spend a lot of time working. In fact, many of us spend an average of 8.9 hours working or in work-related activities (and 7.7 hours sleeping), per workday, according to the U.S. Bureau of Labor Statistics. 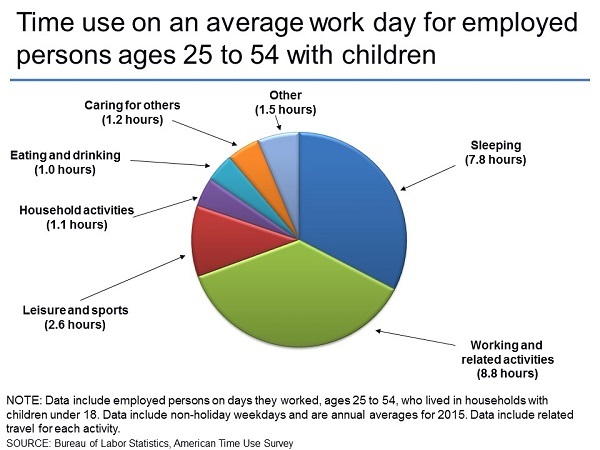 That’s almost 24% of our time (if you count weekends) working — and that’s assuming you don’t work on weekends. Now employers are becoming more involved with the well-being of their employees—not just because it can reduce sick days but also because it can improve employee morale and help reduce medical spend. Many employers, especially those who are self-funded (meaning they pay for all insurance expenses out of pocket rather than having an insurance company, although they still use insurance providers for the network of doctors you see) have started building on-site wellness clinics. Imagine that instead of taking two hours out of your day to make a trip to the doctor’s office you could just walk into a clinic, see a chiropractor, pick up your prescription or even see a health coach — without ever leaving the office. Nationwide, 29 percent of companies with more than 5,000 employees provided work-site clinics in 2015, according to a survey by human resources consulting firm Mercer. After opening an on-site wellness clinic, many employers see a decrease in their healthcare spend. They can then pass those savings on to the employee. Because they’re also able to directly affect and see improvements in their employees’ health, employers can have higher negotiating power when talking to insurers, which only furthers the cost reduction for both employees and employers. No matter the company, the greatest asset is always its employees. Software breaks down, so does hardware. The only asset that can take care of that is human power. When employees’ lives are improved, employers benefit too, from the increased productivity and positive morale. If you are a large employer, adding an on-site wellness clinic can go a long way in attracting talent, especially if the candidate has a family, plans to start a family or has any pre-existing conditions. On-site clinics give time back to the employees—time they can spend with their loved ones instead of stressing out about the workday they had to take off to see to their medical needs. Sometimes employers also allow immediate family members to use the clinic’s resources, which can save the whole family time and stress. We’ve all been there—sick or injured and tired while at work and needing to see a doctor, chiropractor, nutritionist or physical therapist. By offering these services on site to employees, employers create harmony for the employee with as little disruption to their day as possible. This is a growing trend among organizations and also alongside real estate developments; many new apartment homes are now starting to feature on-site clinics. Why should you need to drive to the doctor’s office when there can be one on-site? And this concept is not just for startups. Disney, Western Digital and other Fortune 500 companies have opened clinics for their employees. Much of this is also being driven by Accountable Care Organizations and insurance providers getting more strict about what they authorize payments for, which drives pay for performance rather than just a fee structure in which patients are seen as transactions. This will be a trend that continues to grow and it won’t just be the employer coming into the space. You’ll also see health systems, your local pharmacy and even retail developers expand into this, such as Providence’s Express Care clinics in Walgreens. Ultimately this is great for the consumer as everyone is now looking at “whole-person” care and bringing mind, body and spirit together. All in all, these advancements — while they may seem slow to those outside the space—are great strides toward transforming healthcare and increasing its ability to adapt to new societal norms. Even more interesting — and less talked about — is how these on-site clinics are actually transforming healthcare in ways no one saw coming. In the traditional healthcare model the doctor gets paid for each visit — and of course a doctor should get paid. However because of this and increases in costs, the doctor has to see more and more patients in order to have a successful business. This is why people commonly joke about how long they spend in the waiting room (it is, after all, a waiting room) compared to how little time the doctor spends with them. A typical visit to the doctor’s office includes 64 minutes waiting for care or filling out forms. An on-site clinic is not driven by the same economics. The clinic’s doctors and staff members are already fully employed and paid by the employer so there’s no need to bill for a visit. This increases the time a doctor will spend with you— and reduces the time you spend waiting for them. This is very reminiscent of how care delivery used to be. We’ve all seen movies in which the doctor makes a house call or visits a family. Or we’ve heard stories from grandparents about how they had the same doctor for years. Both of those scenarios seems to occur less and less these days. However, with the changes employers are making, in addition to government regulation changes, we’ll begin to see a full circle change back to this attention to detail. The result will be doctors who are able to spend more time caring about patients’ needs versus seeing patients as transactions. Digital services are also trending upward. Because employers are bearing the entire cost of healthcare for their employees they can demand better services and offerings for their employees. While traditional insurers leave it up to the providing network to determine their technology and tools, employers are demanding better tools. These enhancements are welcome changes to those of us who live in a digital world. And these are just a few of the innovative things we’re seeing coming out of on-site clinics. Usually at this point in a conversation someone will ask me something along the lines of: What about security and privacy? Most people don’t realize HIPAA isn’t there to stop the data flow but rather to offer a secure and accountable way to transfer your medical records — in fact, it’s in the title: Health Insurance Portability and Accountability Act. But the answer here is plain and simple: Your employer can’t view your health data. Employers aren’t—and never will be—able to see your data with your name on it. They can see a “general population” and see data about their employees, however it’s all anonymous. Your relationship with your physician is yours and yours only — they are there for you and only for you. Doctors have taken oaths to protect who you are and what is going on with your personal life. You can rest assured your employer is more worried about them accidentally seeing your data than you are. There are many laws that protect us and employers go to great lengths to protect this info. Healthcare is going through the greatest transformations of any industry since the time of the industrial revolution — OK, maybe it’s not that monumental, but it is quite drastic. Employers are doing their part to help further these changes by improving the care you receive, and ultimately changing the way it’s delivered. You can expect more transformations to your healthcare needs and services, including better results and outcomes. The practice of medicine is about to get a lot more personal, and the best part is: it’s all about you. Posted byMohamed Alkady June 29, 2017 July 17, 2017 Posted inClinics, EmployersLeave a comment on If you could go to the doctor while at work, would you? Relevance is a quintessential need that you must have in order to achieve anything in life. It is relevance that keeps your employees happy, it is relevance that keeps you in relationships and it is relevance that gives you the drive to do what you do every day – day in day out. However relevance is NOT a permanent state and changes as your experience changes. This is the connecting glue of our interactions with life, people, work, and our beliefs. In order for something to have significance it must first start with relevance. Have you ever noticed how at any event people with similar interests – relevance – are grouped together? This is because they have a relevance that means something significant to them. Ever tried to enter that circle? If you don’t have the relevance, entering it is like riding a bike with no handlebars. This applies not to just events but even to relationships with work and romance. To understand what makes relevance so significant, we have to go back to the root – the belief. Beliefs are so powerful because they are rooted in the past but are very present, they transform who you are, they speak to your values and most important of all when they turn to relevance they become action. will strengthen the significance of it – until another belief is able to shatter the later. Relevance is an amazing and powerful insight that once you can truly understand the root of the belief you can execute it and make a change. The best use of relevance in the business world is the visioning process – simply put a vision is the glue that is relevant and everyone who reads it either agrees or doesn’t – if they don’t they don’t have to work with that company, but if they do then their actions, their goals, and their beliefs will drive the significance of that relevance. With relevance you can build great tribes and connect with people that will only accelerate your goals. Take the time to understand what your beliefs are, how they are relevant to what you are doing and how significant they are to you. This understanding coupled with passion can create shattering results – think about what the iPhone did to the world of cell phones. Finally make sure your actions follow – and step by step, brick by brick, you can create, build, invent and most of all make a change in yourself, in others and in the world. people can talk, quite a bit actually, about everything from their dreams to things they will do. this is a very strange phenomenon as a society we have come to to talk about things we WILL do but rarely even really think about doing them. i do think there is some good intention when words come out, however actions are not expressed in words. there is something to be said for the fact that words can provoke action, however words are not action, words are a placebo for the mind. action expresses priorities – which means that what you DO will actually be what your priority is. if someone says that they want to go find a job and then next think you know their playing a game – now you know their priority. everyone carries a temple with them – but rarely is it taken care of. if you knew you had a temple, the best anyone has had, full of everything you could ever imagine, wouldn’t you take care of it? that temple is your body; everyday you abuse that temple and rarely take the chance to take care of it until someone who is close to you suffers from something. your temple needs cleaning, good care, and most of all attention – what it gives you in return is endless. too often we abuse our temple and then wonder about the outcomes years later. like any building it withers with time, and if repeatedly not taken care of – will not last for its intended duration. nothing is ever smooth sailing – in fact the smoothness of the sail depends on the imperfection of what you are doing. It is the way you move with the currents, the way you deal with the swallows, and the wind that will make your journey either smooth sailing or awfully bumpy. we often try to fight our way through a situation, when in reality if you were to just go with it and go in the direction it wants you to go you end with a much smoother sail. are you going to end up where you intentionally wanted to go? maybe, maybe not, but either way at the end you will have enough energy to get where you want to go; and who knows the journey may change your desire. There is a trap that we tend to fall into – this seems to be a psychological enforcement caused by humanity – which derives from one basic concept that is drilled into our heads: by pleasing others you gain happiness. This is true that pleasing others does make one happy but this is also a trap, on one side this can be your ego playing and then helping others you are always looking for what makes you happy OR you endlessly try to make one singular person happy. It is not possible to make everyone happy, the key to this is to find what truly makes you happy and give back in that scenario – think of it as playing in a niche market or better yet as simply put by many: play by your own rules. This phrase is uttered more throughout the day than any other phrase I can recall, everyone has a bucket list, everyone has a wish list and everyone is waiting on tomorrow. And everyone has an excuse. It never ends there is always some reason, and that is what the mind will do is create reasons over and over and over – justification doesn’t make your excuse any better, eliminating the excuse is the only way. Tomorrow never comes because when tomorrow is here it is no longer tomorrow – live today, live now, don’t wait until tomorrow, move your energy, move your being. As you will find on many american bars: free beer tomorrow – last I checked no one has ever gotten free beer, just go out and buy one. Mohamed Alkady, Proudly powered by WordPress.